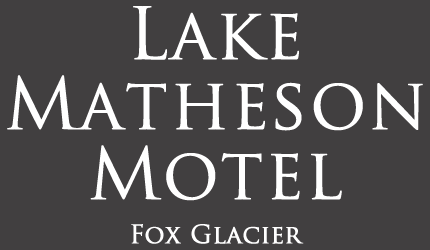 Don't let our name mislead you because Lake Matheson Motel is definitely a motel in Fox Glacier! You'll find us situated just 400m away from the main street of Fox Glacier. Lake Matheson, for which we are named, lies 4km further along Cook Flat Road and we'd certainly recommend you visit it during your stay. Drive into the Fox Glacier township. Take the first and only road on your left and drive down this 400m. On your left, you will see the Lake Matheson Motel sign. Drive into the Fox Glacier township. Take the first and only road on your right and drive down this 400m. On your left you will see the Lake Matheson Motel sign. Extremely helpful, friendly service, comfortable beds and roomy room... thank you for arranging our heli-flight at short notice and for a very comfortable night.